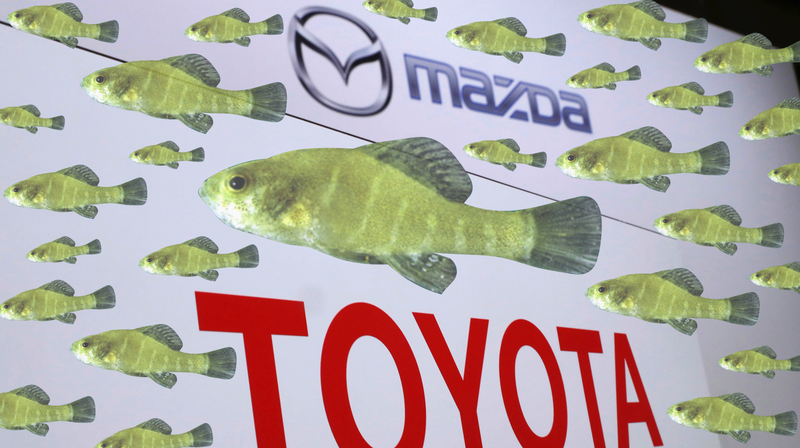 A banner from the announcement on the Toyota-Mazda plant and the spring pygmy sunfish. During the entire last half of 2017, more than a dozen U.S. states were making a fuss to become the site of a $1.6-billion production plant for Toyota and Mazda. Now that the companies have picked Alabama, the fuss has changed—the plant could put a rare fish species at risk of extinction, according to a recent lawsuit. The lawsuit, filed in the U.S. District Court for the District of Columbia and found by AL.com, never explicitly mentions the production plant or the car companies, and neither Toyota nor Mazda are the targets. Instead, the lawsuit was filed by the Center for Biological Diversity, a nonprofit organization that helps species nearing extinction, challenging U.S. Fish and Wildlife Service’s alleged failure to comply with parts of the Endangered Species Act for Alabama’s spring pigmy sunfish. That alleged failure means there’s a lack of legal protection for the only known habitat the fish has left, and the development around the plant could directly harm the species—“putting the remaining populations at risk of extinction,” according to the lawsuit. As of April, AL.com reported that construction on the plant was supposed to begin by Oct. 1. Jalopnik has reached out to Toyota and Mazda for comment about the lawsuit and to ask whether precautions will be taken, and we also reached out to the U.S. Fish and Wildlife Service to ask if it had comment or responses to individual claims in the lawsuit. We’ll update this story if we hear back. In January, Toyota Motor Corp. and Mazda Motor Corp. announced plans to build a massive automobile manufacturing plant just west of Huntsville and adjacent to the Beaverdam Spring and Creek complex. Beginning as soon as 2021, the 2,400-acre site will house a plant with two manufacturing lines that will produce up to 300,000 cars annually. The plant will come with enormous amounts of new roads, buildings and parking lots. These will impact water quality and disrupt water flow to the springs where the rare fish lives. Without proper minimization and mitigation, the spring pygmy sunfish could be pushed to extinction. The Toyota-Mazda joint plant should employ around 4,000 people and make around 300,000 vehicles annually once things get going in the next few years, which is why so many states fought for it. But the center isn’t focusing the suit on the plant itself, and is instead claiming the Fish and Wildlife Service failed to follow the law in helping protect the sunfish from this kind of development. The striped sunfish rarely grows longer than an inch and lives in dense plants underwater in northwest Alabama, according to the center’s lawsuit, and it’s been presumed extinct twice since its discovery in 1937. The lawsuit also claims the fish used to live in three natural spring systems, before river damming and water contamination ruined its habitat in every place but one—the Beaverdam Spring and Creek area, where the center claims the factory and subsequent development could harm the last remaining sunfish. Attempts to reintroduce the sunfish to the other two areas it used to live in failed, according to the lawsuit. The center claims that the Fish and Wildlife Service failed multiple times to do what the Endangered Species Act requires, which is to designate a “critical habitat” for a species it lists. After the center petitioned the Fish and Wildlife Service to list the sunfish as endangered in 2009, the lawsuit claims, the service determined it to be “threatened” four years later. The sunfish is still listed as threatened in the Fish and Wildlife Service’s database of endangered species. On October 2, 2012, the Service proposed listing the spring pygmy sunfish as threatened and designating eight stream miles and 1,617 acres of spring pool and spring influenced wetlands as critical habitat. ... Then, on October 2, 2013, the Service listed the spring pygmy sunfish as a “threatened” species under the Act, however, it did not designate critical habitat. ... To date, the Service has not designated critical habitat for the spring pygmy sunfish. The lawsuit claims the service was required by the act to designate a critical habitat by the time or before it listed the sunfish on Oct. 2, 2013, and that it’s “in violation of the Endangered Species Act” since it has yet to do so. There were periods of public comment on the sunfish’s proposed critical habitat in April of 2013 and February of 2014, according to the lawsuit and U.S. Fish and Wildlife Service records. The service’s records don’t list a critical habitat as being decided upon, and the Endangered Species Act doesn’t protect a species’ critical habitat until it’s been designated, according to the lawsuit. If this is the case, the Service will work with the federal agency and, where appropriate, private or other landowners to amend their project to allow it to proceed without adversely affecting the critical habitat. Thus, most federal projects are likely to go forward, but some will be modified to minimize harm to critical habitat. Designating a critical habitat means actions have to support the survival and recovery of a species, according to the lawsuit, and the lawsuit claims the sunfish’s “very existence remains at risk until the Service fulfills its statutory duty to protect the critical habitat.” The main ask in the lawsuit is that the court declare the Fish and Wildlife Service violated the Endangered Species Act, and that the service designates a habitat by a certain, currently unspecified, date. If it doesn’t work out in the Center for Biological Diversity’s favor, Toyota and Mazda production numbers may soon begin multiplying while this small fish’s population does the opposite. Update 3:20 p.m. A representative from the Fish and Wildlife Service responded to Jalopnik’s request, saying the service can’t comment on pending litigation.